There are five other Airstreams here! That may not seem like a lot, but it’s a record for any campground we’ve visited on this trip. In fact, it’s the most we’ve ever seen together outside of a rally. 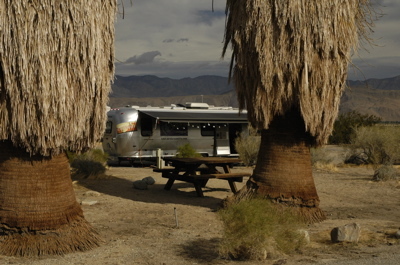 So I walked out into the desert sunshine this morning with Emma to go give each one a copy of Airstream Life. There was a 1990s Sovereign 25, a new Classic 30 slide-out, a new International CCD 19, and a 1970s Argosy 24 motorhome, and a unusual 80s “Squarestream” 29 footer with two entry doors. I got a chance to chat with the owners of the Squarestream (which, if you haven’t seen one, is a boxy fiberglass trailer that Airstream produced only for a short period. They were happy to give me an inside tour while Emma took pictures of their dog with her digital camera. Our campsite is rather ordinary in that it is basically a parcel of pavement off one of the campground loop roads. But the view is extraordinary, surrounded by mountains on three sides, which constantly change in color and detail with the movement of the sun and clouds above. A pair of enormous fan palms (the only type to grow here) are nearby in the sand, casting a morning shadow on our trailer. The fan palm itself is an interesting thing. They let their upper fronds droop as they grow, sheathing the core of the tree in a thick layer of brown leaves. They are large and magnificent when they mature, like redwoods of the desert. A group of them is a sure sign of water. 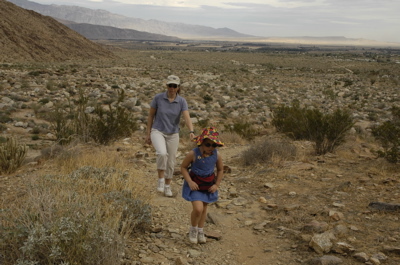 Anza-Borrego is a place for exploring. There are literally hundreds of square miles of area here, filled with wildlife, flowers, canyons, streams, oases, geology, off-road trails, abandoned mines, and hiking trails. The desert is far from empty, if you care to look beyond the highway. We took Emma on a little hike up to Palm Canyon. 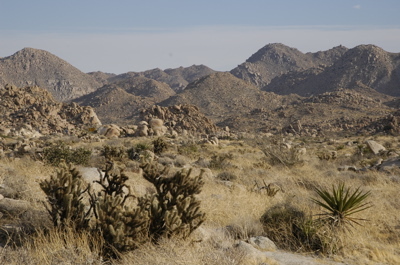 This mild 1.5 mile trail (one way) climbs up a dry wash strewn with boulders from giant floods that tumbled down the mountains over thousands of years (and as recently as last September). 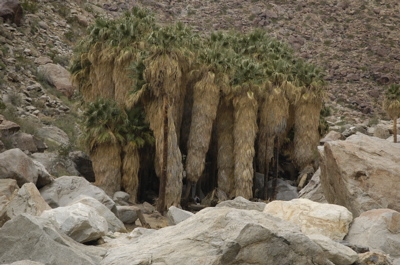 It turns to a rocky scramble, crossing a perennial stream several times, and ends up at a palm oasis. Along the way we had terrific homeschooling opportunities, talking about desert plants, rocks, and animals. 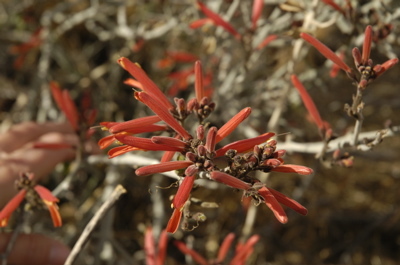 You’ve got to look closely if you want to spot desert flowers. They are out there in abundance when there is water to be had, but often hiding. Heavy rains last September left enough moisture in the ground for them to survive to now. We spotted them in many colors, including a royal purple, a bright red (whose shape was designed for hummingbirds), orange, yellow, and white. The extra moisture has encouraged other creatures as well. Yesterday we spotted a desert fox, and today we saw a beautiful “Costa’s hummingbird” and honeybees pollinating the desert sage. Unfortunately we struck out on the bighorn sheep, but we have thoughts to try again tomorrow morning when we are more likely to see them. There have been reports of a mountain lion too, but it is very unlikely we will see one since they avoid humans as much as possible. This is “bad weather” for the desert. The wind was blowing gusty all day, and we had a tiny sprinkling rain hit for about 30 seconds this evening. Chance of rain tonight is an astonishing 50%. But nobody’s expecting more than a drip or two. This place only gets 6 inches of rain per year on average. Tomorrow should be nicer. 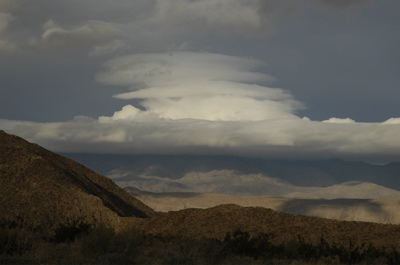 I posted a pile of photos on Flickr tonight, under the album name “Anza-Borrego Desert State Park”. You’ll see a lot more than what I’ve talked about here if you check them out. This morning we hitched up and moved out! 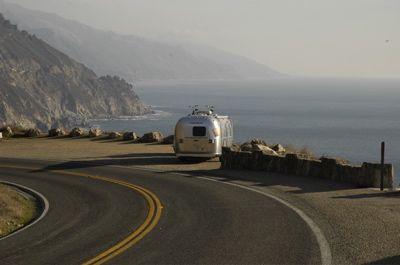 We pulled the Airstream up to 4000 ft elevation on I-8, crossing the rocky summits and winding down slowly to the desert floor on the eastern side. It was a marvelous scenic trip through a very quiet corner of California. Halfway along I-8, we pulled off onto an abandoned road somewhere near the border of San Diego and Imperial counties and took in the view while we had lunch. View from our lunch stop. Because I was having equalization problems due to the aftereffects of the cold, we took a massive detour which allowed us to descend more slowly. It also doubled the length of our trip, and bypassed the historic town of Julian. We’ll stop in Julian on the way back, instead. This spot rocks! 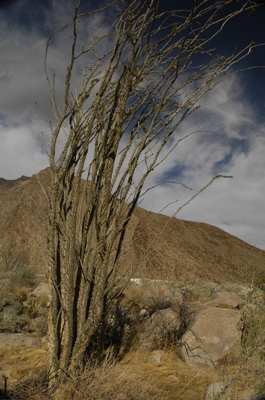 Borrego Springs is a small town in the middle of a very big desert state park: Anza-Borrego State Park. We’re camped in one of the two state park campgrounds, just west of town at the foot of the mountain range. Full hookups, five bars on the mobile phones, good Internet service, endless sunshine and 70 degrees every day! 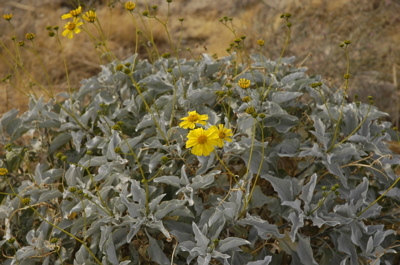 Plus, the heavy rains of last summer have yielded a bonus: desert flowers out of season. We’ve already spotted a few. There’s lots to do. This is high season for the park, so there are three ranger talks each day, nightly campfire programs at 7:30, and Anza Borrego is famous for great hiking, bighorn sheep, and off-roading. Even the campground is fun: everyone has colorful lights on their awnings and glorious wood campfires on the sand (in fire rings), probably getting in the mood for New Year’s Eve. I think we’re going to like it here. Tomorrow, we have some hikes planned. I’ll start posting pictures tomorrow night. I am pleased to report that Operation Kill Paper has been a success already, although it is not complete. 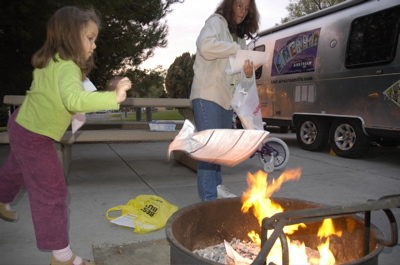 I’ve reduced my paper to about half of what it was, and we celebrated with a paper bonfire at sunset. If we’d had some wood handy I would have gotten a proper fire going — the evening temperatures are perfect for it. One of the very best places in San Diego is Balboa Park. A beautiful and architecturally interesting place, it is both a series of green parklands and world-class collection of museums. On Saturday we visited the Museum of Natural History, on Christmas we went there for the San Diego Zoo, on Tuesday (while I was stuck at home with a cold) Eleanor & Emma went to the Aerospace Museum, and today we returned to go the Reuben Fleet Science Center. 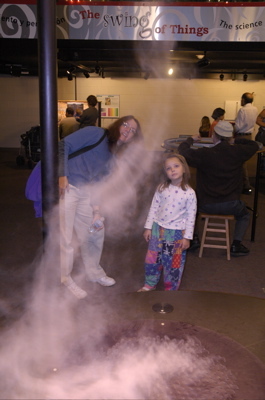 Among other things, Emma got to learn about tornadoes. The question now is whether we’ll depart tomorrow for Borrego Springs or hang around San Diego another day. We’ll decide tomorrow. Pay no attention to “the man behind the curtain” or in this case the man under the quilt. I think Rich has taken too much cold medicine and he needs a nap. We are still going to Borrego Springs, not Hollywood, on Friday. My friend Rob forwarded me the address for a new movie, called “RV”, which is coming out in March. The plot is basic: Dad (played by Robin Williams) decides the family is falling apart, and decides to take them all on a giant RV adventure to bond. This go disastrously, of course. From the promotional trailer, it looks long on visual comedy and short on reality, but Robin Williams should manage to make it funny. This movie has to be inspired by the resurgence in RV travel over the past four years. People started shying away from air travel in 2001, and RV sales boomed. Families started discovering that spending time together wasn’t so bad. And now Hollywood is acknowledging that trend with a major motion picture. This gives me an idea: Perhaps we can turn back to Hollywood (only 75 miles north of here) and pitch a movie based on our lives in the Airstream. Matthew McConnaughy can play me (we’re practically twins), and I think Elle McPherson can play Eleanor. I don’t know who can play Emma but I’m sure the casting agent can come up with some precocious kid. There was a little girl in “Cheaper By The Dozen” who was pretty close to an Emma. The plot would be about a family that decided to chuck it all and travel together in an Airstream. Along the way they encounter a strange mystery. While studying condors in the Los Padres National Forest, they discover opals in a place they shouldn’t be. With the help of their Internet friends, they research the true origin of the opals and unwittingly crack an enormous smuggling operation hidden in a small California town. At first, the townspeople reject the family as a bunch of suspicious out-of-staters, but eventually Emma wins them over with her charming handmade greeting cards. A scene from the movie, just before the bulldozer arrives! It’s a mashup of Hitchcock, Scooby Doo, and Indiana Jones. Classic stuff! Eleanor, forget Sea World — we’re going to Hollywood! I wish I could offer you some exotic story about the glamour of Airstreaming today, but it’s not much fun when you’re sick. It seems like part of the package of taking a once-in-a-lifetime trip should be guaranteed immunity from illness, but the truth is that anything can happen, and does. Including the common cold. So I’m sitting at home in my pajamas breathing through my mouth (the nose has closed shop for a few days) and working on Operation “Kill Paper”, while Eleanor and Emma are taking the opportunity to do the laundry, pick up our forwarded mail, and buy cold-related supplies for me (extra tissues, various medications for the symptoms). If they could find a full-body condom to wrap me in so they don’t get the virus I think they’d buy that too. But we’re all making lemonade out of it as best we can. Eleanor met a women with five kids at the laundromat, and discovered through that connection that some museums at Balboa Park are free on Tuesdays. The specific museums offered for free change every week. So she dropped off a few things here and then whisked off to have fun at all the places I’d like to go: the Automotive Museum, the Aerospace Museum, etc. Meanwhile, back at camp I was pleased to receive a blog reader by the name of Byron, who turned out to be a charming fellow who is currently doing a motorhome restoration. He didn’t mind that I am a dripping, coughing mess today — and he invited us over to his canyon home in San Diego. If I am more pleasant to be around by Thursday we will definitely drop in for a visit. That’s the best way to get to know an area, in my opinion. Thanks for cheering me up, Byron! I went to bed last night knowing I was getting a cold — again — and today when I woke up, there it was, in my head, telling me I wasn’t going to the museums or the Old Town or the state Historic Park today. But that’s OK. We all needed a quiet day. E & E parked themselves at the dinette and worked on their various projects (drawing for Emma, and writing a Christmas letter for Eleanor), while I cleaned up old email correspondence using my laptop in bed. At 1:30 pm we had to move the Airstream to another site. When we arrived at Sweetwater Summit, our site couldn’t be booked for the whole week. We knew that on Monday we’d have to hitch up and go 100 feet to a different one. Not a problem either, since it was time to dump the tanks. By 2:30 we were done and set up in the new site, and the sun was shining, my head was feeling better, and it was time to launch Operation Kill Paper. We headed out to Circuit City and bought a Canoscan LiDE 60, which is a $80 scanner. It’s slim and lightweight, perfect for RV life. With it, I plan to eliminate all the folders of paper which currently occupy two large file boxes in the back of the truck. If you only use your Airstream for recreation, you don’t have this problem. But I have to travel with an entire office all the time. It’s amazing that I can operate a magazine with only two boxes of paper (everything else is digital), but I’m not satisfied yet. Those last two boxes have been a persistent thorn in our sides. They don’t fit in the trailer well. They take up too much space in the truck. And 99% of the time, we don’t need them. It’s just stuff we are carting around “just in case”, like receipts, paid invoices, tax records, documentation, etc. Well, my photos are digital. My writing is digital. My music is digital. And it all fits on a backup hard drive only about 6 inches long by 3.5 inches wide. So why am I carting around two big boxes just for a some paper documents I hardly ever need? Let Operation “Kill Paper” begin! I just put the paper into the scanner, press one button, and it turns into electrons in about 10 seconds. Then the paper goes in the shredder. Ahh, the joy of eliminating unneeded stuff! This week, while I am sick with a cold and have not a lot of other work to do, I am going to scan as much old paper into PDF format as I can. Not only will it save a ton of valuable space (and full-timing with a family, every cubic inch counts), but the resulting files are searchable, so I can find documents much more quickly than I could before. I’ll let you know how it goes. Tonight Eleanor is making the pork roast. I can smell it even with a stuffy nose and it smells wonderful. Hopefully tomorrow I’ll be feeling better and we’ll go out. But if not, I’m going to send E & E out and I’ll stay here and scan to my heart’s content.